KATHMANDU, Aug 3: Most of the projects financed by the Asian Development Bank (ADB) continued to move on a slow pace in the second quarter of 2018. According to the ADB, only 70 percent of the target has been achieved in terms of awarding contract for the projects co-financed by the Manila-based multilateral lending institution. Out of the targeted contracts worth $149 million in the second quarter, only $104 million worth of contracts were awarded in the review period. 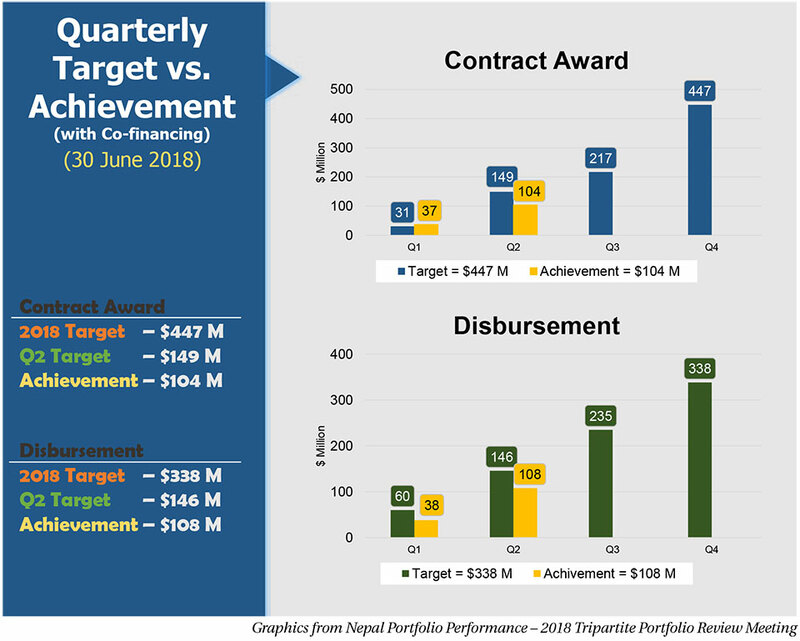 The contract awarding process looks even more dismal if compared to the annual target. The contract award represents only one-third of the annual target of $447 million. The progress toward fund disbursement is not encouraging either. The latest data shows that only 74 percent of funds in the ADB-financed projects were disbursed as of June-end compared to the disbursement target worth $146 million. The ADB has set a target of disbursing $338 million in 2018. Rural Connectivity Improvement Project and Regional Urban Project are the two major projects where the contract awards target has been met. 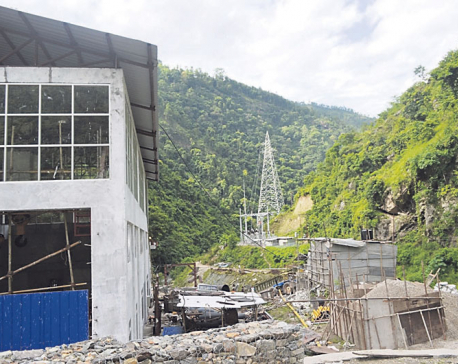 However, Tanahu Hydropower Project Air Transport Capacity Enhancement Project has failed to meet quarterly targets for awarding contracts. Majority of the projects have failed to achieve the second quarter targets for fund disbursement. Contract award and disbursement are two major indicators that gauge the performance and progress of any project. Out of the ADB's total Nepal portfolio of $2.3 billion for financing 33 projects (27 loans and 17 grants), contract award worth $447 million is set to be achieved in 2018 while $338 million is planned to be disbursed in those projects. If the second quarter performance is something to go by, the annual progress of the ADB-financed projects is likely to remain poor this year, according to observers. Admitting the slow progress, senior government officials and ADB staffers reiterate their calls for expediting the ongoing projects. “This status definitely puts extra pressure to project managers and concerned executing agencies for expediting implementation of ongoing projects,” said Rajan Khanal, secretary of the Ministry of Finance, addressing the 2018 Tripartite Portfolio Review Meeting. The meeting that is organized thrice a year reviews the performance of ADB-financed projects and provide advice for addressing the challenges faced by the projects. Khanal also said that systematic issues mainly related to human resource management, technical and project supervision capacity and weak contract management still prevails as the barrier for smooth implementation of projects. “As we all are aware that project implementation challenges remain with the state restructuring process, the government is preparing a comprehensive, consolidated and time bound action plan for implementing all the policies and programs reflected in the budget along with other ongoing projects. While terming the achievement 'slow', Diwesh Sharan, deputy director general at the ADB's South Asia Regional Department, also expressed concern over the impact on various projects due to state restructuring process. “The new budget has released funds to provincial and local governments. This has affected few ADB supported projects in terms of implementation arrangements and fund flow mechanism,” said Sharan. “These issues will be described in the sector and project presentation today. I urge the Ministry of Finance and concerned ministries to agree on time-bound actions to ensure effective project implementation,” he added. He also highlighted the slow progress in some flagship projects like Tribhuvan International Airport, Gautam Buddha Airport, Melamchi Water Supply and its associated Kathmandu Valley Water Supply Projects. “Close monitoring of progress and decisive actions are needed for the civil aviation and water supply projects to improve and accelerate implementation, and to ensure targets and results can be achieved for these flagship projects,” he added.